Part of the value of CRYSTOBAL’s Vampire Killing Kits lies in the fact that he does not “mass produce” these kits. 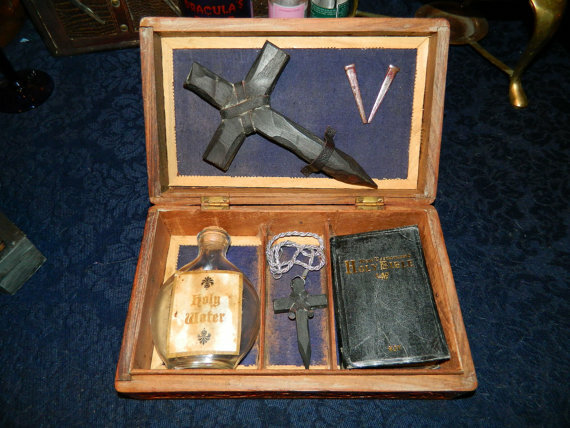 His vampire slayer kits are all hand made, one at a time, and each is distinctively different from the others. He uses the finest materials available within the price range of the kit. In the past, CRYSTOBAL only created kits for special order, like movie or stage props, or for private collections. It’s only been in recent years that he began creating kits specifically for the online market, making them both beautiful works of art and affordable. Currently, CRYSTOBAL only creates two to four new kits per year. This makes them instant collectibles, and ensures their value over time. The scarcity of his kits is part of what gives our customers the ultimate pride of ownership. View our photos of vampire killing kits.